A virtual reality biomechanical facility can improve our understanding of physical movement and help treat injuries. Knee reconstruction surgery was once the domain of people who needed the operation due to old age. But a recent study by the Medical Journal of Australia showed that from 2000 to 2015, the incidence of anterior cruciate ligament (ACL) reconstruction surgery in the country increased in all age groups, with the overall incidence the greatest among 15 to 24-year olds. With about 72 percent of ACL reconstructions in Australia sports related, could something be done to prevent these injuries and reduce the burden on the health system and the injured person? A team of researchers from the University of Melbourne is looking at this question using a new virtual reality biomechanical facility to improve our understanding of physical movement and how to treat and prevent injuries. The Computer Assisted Rehabilitation Environment (CAREN) was launched in March this year and features a dual belt treadmill that sits on a movable platform that can measure force. 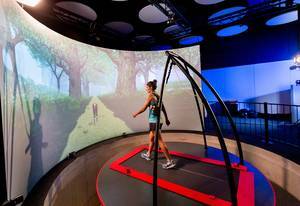 Around the treadmill, a large, curved screen can project VR scenarios that can be coordinated with the platform, with markers placed on a person according to anatomical landmarks. “The position of the markers tells us exactly where the joints in the body are,” said Professor Peter Lee from the Department of Biomedical Engineering at the University of Melbourne. Sensors and motion capture cameras, similar to what is used in Hollywood for movies, are then able to create a three-dimensional computer model of a patient’s body. The system was developed by Motekforce Link, which uses technologies to study balance and locomotion disorders. The advantage of the CAREN is that while other systems can measure a person’s movements, these are typically in static environments. 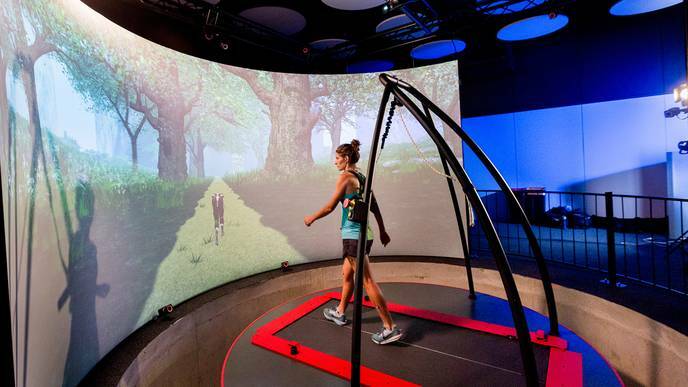 On the other hand, the CAREN has a moving ‘ground’ — the treadmill and platform — and uses VR to simulate a real-life scenario to help elicit more realistic physical and visual responses from them. Audio can also be played to create a distraction to prompt other responses. For example, as the person is strapped to a harness, the team can safely simulate tripping and record the impact it has on the body. “There’s a lot of discussion about should we brace or should we not brace the knee, because bracing can also reduce the performance of the athlete, which is why most athletes don’t want to brace their knees,” Lee said. In order to study this, the team has been getting users to simulate jumps from heights of 30 cm to 60 cm, both while wearing a brace and not wearing one. From there they use a model to try and predict the load on the ACL. “What we’ve found is the muscle forces do behave quite differently with bracing and without,” Lee said. Although Lee says that based on this there is the potential that bracing could help to reduce the force on the ACL, the team is still working on refining the model to predict the effectiveness of knee bracing in reducing the load on the ACL during intense dynamic movements. The team has also been working with the Royal Melbourne Hospital looking at studies with amputees and is also hoping to build on the CAREN’s capabilities and start a project that combines the system with recording neural information. This could be used to determine how cognitive and physical loads interact with each other. Lee says the main challenge with this type of project would be the vast amounts of data that would be collected and understanding how that data interacts. “I think we all know that in order to move forward, we need to bridge the [physical and neural side]. Trying to bridge the two is going to be very challenging,” Lee said.